If you are looking for a perfect vacation destination this spring season, take a train tour with Branson Scenic Railway where you can have the chance to see the beautiful landscape of the Ozark Mountains that turn from white to green. This great train ride will give you the most of Branson outdoors giving you unforgettable moment as you enjoy the excitement of train travel. 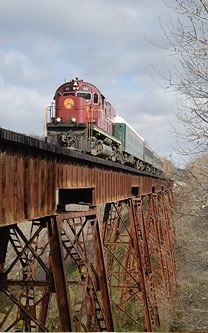 Taking a train excursion tour is a perfect romantic escapade for couples who want to see the beauty of Branson outdoors. Branson Scenic Railway started its train tour excursion after the completion of the White River Railway in 1905. The railway company spent around $12 million to lay 239 miles of track through the rugged terrain of the Ozark mountains. Branson Scenic Railway tour excursion includes routes to the south and the north where many areas feature panoramic views of the Ozark foothills giving you the chance to enjoy a refreshing atmosphere that you can’t experience in the city. Many of the routes are inaccessible by car, so it’s a great opportunity to see the vistas by way of the Branson Scenic Railway. When Reuben S. Branson moved to White River (now called Lake Taneycomo) and Roark Creek as early as 1882, the name Branson came into existence. With the construction of the railroad around the Ozark mountains, tunnels were blasted and many tresties were built to support the gorges through the mountains. When the railroad was completed, Branson started to flourish and the people had the first opportunity to travel by train. Branson Scenic Railway suddenly became a popular tourist attraction during those days where many people wanted to experience the most exciting train travel adventure. When the train operation of the Branson Scenic Railway was started in 1993, they offered a daily train tour excursion using commercial railroad line for its travelling tourists. The train will travel either north or south. The northern route goes as far as Galena, Missouri while the northern route will travel as far as Arkansas. During the train travel, the narrator tells the story of the area where the train traverses. He points out the communities as the train travels and educates passengers the construction history of the railroad. Branson Scenic Railway takes the passengers 3 to 4 times daily on a 40-mile round trip travelling to the mountain spots of the Ozark Mountains. The train travel takes 1 hour and 45 minutes to complete the train excursion tour. As you enjoy a wonderful moment on board first class dining car, you will be served with hot cocoa along with delicious baked cookies and a gift of special souvenir mug. As the train tour nearing to an end, you can have a great view of city attractions such as live entertainment spots, theaters, and shopping outlets. When you take a train excursion tour with the Branson Scenic Railway, you can have the chance to see the beauty of the Ozark Mountain that turns from white to green.